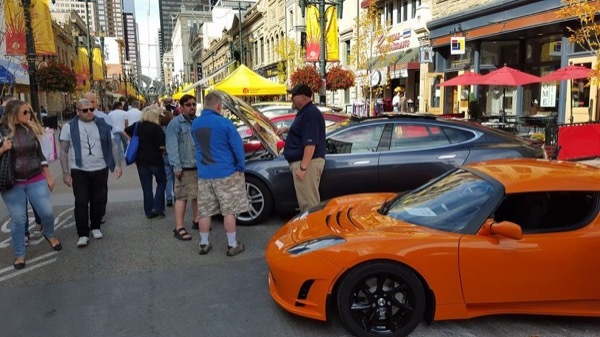 Electric Vehicles created a buzz in downtown Calgary with the largest and most diverse EV gathering in Alberta history. 23 EVs were on display including 12 unique models which highlighted the widespread availability of electric vehicles to meet most consumers' needs. Hundreds of Albertans learned about the advantages of driving electric from owners who answered questions and provided vehicle tours. Also hundreds of handouts were distributed highlighting the advantages of EVs and promoting the Electric Vehicle Association of Alberta (EVAA) whom organized the event. EVAA was founded on Earth Day 2014 to promote electric vehicles and charging infrastructure in Alberta. Currently there are over 430 members, an impressive increase from 130 members at the 2014 event. Please join EVAA at www.fb.com/groups/yycEV. Media in attendance included 660 news who promoted the event and played interviews on air all afternoon. Calgary is Green also shot video and interviews that will be featured online. Want to learn more about electric vehicles (EVs)? Find out the benefits of driving electric from long time EV owners who will be happy to answer your questions while you stroll down Stephen Avenue Walk checking out dozens of vehicles from manufacturers such as Tesla, Chevrolet, Nissan, BMW, Kia, Toyota, as well as custom conversions! This is the second annual National Drive Electric Week event being proudly hosted by the Electric Vehicle Association of Alberta (EVAA). EVAA was founded on Earth Day 2014 with the long term goal of promoting the adoption of electric vehicles and charging infrastructure in Alberta. Our members - now more than 350 strong - are passionate EV owners and enthusiasts alike with the same vision of spreading awareness and knowledge about electric mobility in a sea of misinformation. If you are interested in EVs or already own one, please join us for free at www.fb.com/groups/yycEV or email pluginAlberta@gmail.com. Registered attendees report 395,598 electric miles driven.